FERIDIES offers California Pistachios that are gently roasted, naturally opened and lightly salted creating an irresistible and popular snack. • They are good for your heart. They can lower bad LDL cholesterol from the body. This means that they are a heart friendly nut. They also have antioxidants, phytosterols, unsaturated fatty acids that can help with heart health. • They are a good source of dietary fiber. If you eat one ounce of pistachios, which is equivalent to about 30 grams of pistachios, then you will get about 3 grams of dietary fiber. That is enough to ensure that your digestive tract is working optimally. • They can help control diabetes. Sugars actually form inappropriate bonds with proteins in the body. This makes them unusable and is a process known as glycation. However, the antioxidants that are found in pistachios can help reduce the entire process of glycation in the body and will help control diabetes in the process. • They help with iron absorption. Because of the high copper content in pistachios, they can help with a higher level of iron absorption from other food sources in the body. This can even help people who have conditions such as anemia. • They have aphrodisiac powers for men. Eating 100 grams of pistachios per day can help increase sexual vitality in men and improve erectile disfunction by up to 50 percent. • They can help with weight management. Pistachios are the perfect snack for people who are dieting or trying to maintain a healthy weight. This is because they have lower calories than other options but also have high protein levels, are low in saturated fats, and are high in unsaturated fats. If you are looking for a great snack that tastes good and will also provide some health benefits, our Salted Pistachios are the perfect option. Try some today! 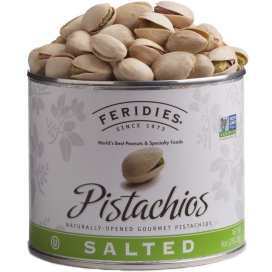 FERIDIES® pistachios are OU Kosher Certified and Non-GMO Project Verified.